I know some of you still have snow on the ground, but for us Floridians summer is already kicking into high gear. And summer means flip flops. Yep, we southern girls have 'em for everything: casual wear, evening wear, 'flops with heels, 'flops with big poofy flowers glued on...you name it. They're cheap impulse buys, so it's easy to accumulate a whole mountain of flip-flops in a single season. But say you don't like the "mountain" storage method. Say you need to get your mound o' 'flops off the floor and into a tidy system, but are limited on space. What then? This was my no-cost solution last year: a left over curtain rod mounted on two shelf brackets, and lots of modified hangers. For the rod you could also use a wooden dowel, piece of PVC pipe, or any other strong bit of metal. To mount it we bent up the tips of two metal shelf brackets and secured the rod with small screws, but you could also use conventional closet rod hangers, which you can find in any hardware store. First, grab a handful of the flimsiest metal hangers you can find in your closet. (You want to be able to bend them with your hands, if possible.) You'll also need a pair of needle-nosed pliers. You may need to score the metal with the pliers and then snap it with your hands. This gets the sharp edges safely out of the way, and also looks kind of cute. Now, to be honest, you could just stop here. I did, for over a year. The hangers are perfectly functional, if a bit chippy and drab. Make sure your ribbon is snug, so it doesn't fall off the hanger. To secure it you can use fabric or super glue - or, if the glue stains the ribbon like mine did, glue dots also work really well. Step 6 shows the backside of the hanger. I suggest flipping it over like this to trim off the excess ribbon. Actually I have even more than this, but I didn't want to hang them all up because then you'd know I have that many flip-flops and it'd be, like, totally embarrassing. Plus, here's a handy bonus: you can also hang your ballerina flats on these! Hey! It's, like, neat and stuff! So, do you guys have any nifty space-saving tips from your closet? Share in the comments! Want more? Come see ALL of my craft projects on one page, right here! Oh, those are the cutest! I don't really wear flip flops, but I have some other sandals (and a couple pairs of fake Crocs) that would go on these very well. 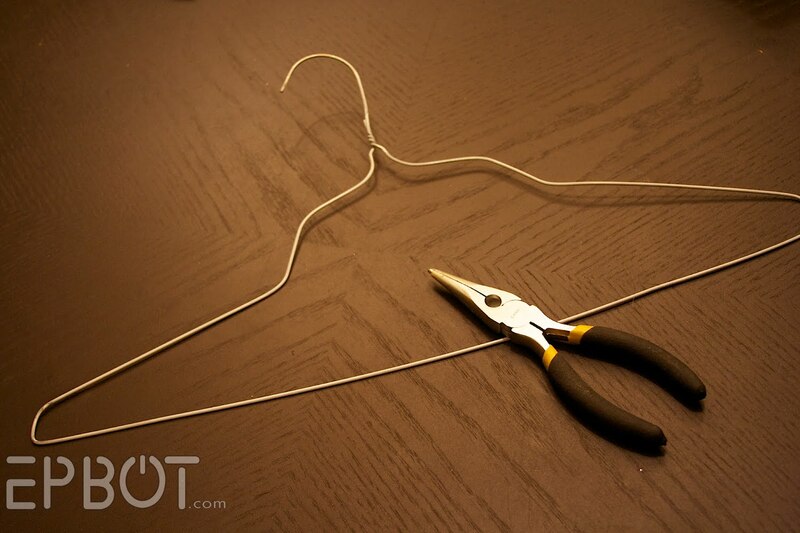 I'll be hunting up some wire hangers this weekend, thanks for the idea. I love that you're yellow boots got not one, but two appearances in this post. Anyway, great idea for the flip-flop hangers. Somehow, flops just look cuter when they're suspended like that then when their on the floor. Love it! And you know those pants hangers from the drycleaners with the broken carboard tubes? Those would work too! Also, if you have the kind of shelving you have there and you don't have a spare rod handy, you *could* just hang the flops from the bottom shelf in the little spaces in the wire shelving. Need closer pictures of the boots! Love this idea! I'm quite jealous of your crafty genius. What a great idea for flip-flops! You my dear are a Genius! Excellent idea! I like this especially because my flip-flops are always getting separated and I have to dig to find a matching pair! I bet this would also work with a spring shower curtain rod if you're going across the whole bottom of your closet. I live in AZ, so I understand the need for cheap flip-flops! I always have a flip-flop foot tan every summer! And I also am not a wearer of heels. My feet hurt too much in them, so I go for flats and boots when I want to wear some nicer shoes. I love your boat shoes--I plan to get some this year. I don't have anything really clever in my closet, but I do keep all of my Halloween socks and t-shirts in a space bag to save room. That's also how I keep my pirate costume. Anything that either doesn't need ironing or can be quickly ironed that I don't wear often goes in a space bag. Easy to store and keeps the clothes clean! Totally cute and very clever! I have no tips to share because my closet is a complete unorganized sty (no judging here) but can I please say how your Converse collection is making me drool? Seriously. I need to put a towel on my keyboard. I'll even the score though- check out the awesome Converse collection I saw in Harajuku while we were there. 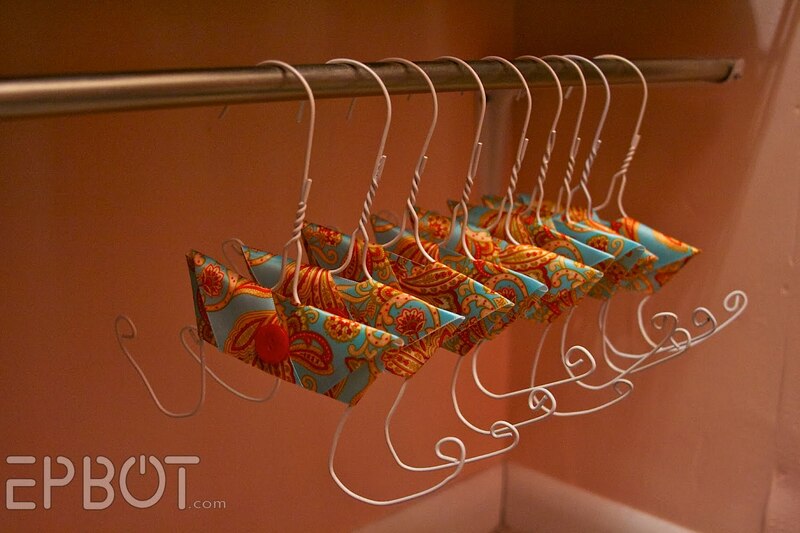 I don't have any great ideas for you...I just want your ballet flats :) Super cute hangers! 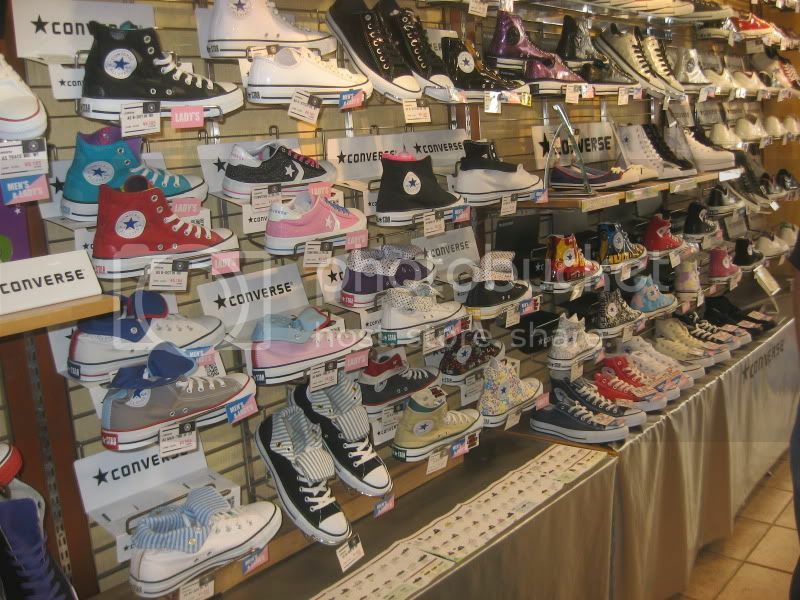 Just for the heck of more wall of Converse to make you jealous. 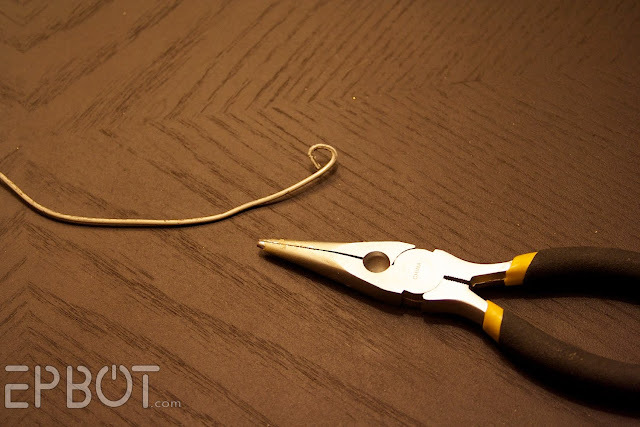 If you want to make your hanger loops more even, then you need to make a jig. All you will need is a few wooden dowels, a piece of plywood, a few screws and maybe a few nails. First, trace out the final loop you want on the plywood. It's probably best to make the sketched loop with about 10 to 15% more curl than you want on the final hanger. next, screw pieces of dowel sticking straight out of the plywood, to make a form that follows the curve that you sketched. Put the dowels on the inside of the curve. Bend your hangers around your new form, and they should all come out the same. You can use finish nails to make a smaller form for the little loops on the end, or get some small brass acorn nuts from the hardware store (probably a size #4-40) and screw them directly onto the hanger end without the little loop. A rolling pin works well, too. If you went to the trouble to make a jig like Branden says, then you could make bunches of these and sell them in etsy... I WOULD BUY THEM. We who have no time (and are too lazy) to craft need to buy from someone. My space saving technique is two pairs of sneakers, and two pairs of dress up, 'cause I'm boring like that. Your closet makes me want to go out and buy lots of brightly colored shoes, just to decorate my closet with. It's so cheerful! Oh, and the flop hangers are awesome, of course. I love this idea! I'm from FL (born and raised in Orlando! ), so I'm with you on the mountain of flops thing. My clever storage idea- a friend gave me a pair of nightstands a few months ago. I chucked them in the closet and now store socks in one drawer, bathing suits (I am from FL and have a ton!) in another drawer, and workout clothes in the other nightstand. They keep things organized without the need for another dresser! Jen! You are a total genius. Looks like I have a project for the weekend! I can't wait to get all 10,000 pairs of my flats and 'flops organized this week! I never wear flip flops but I might or might not own at least 30 pairs of ballerina flats. Great project! But this one looks like a keeper for stuff I've already got. Keep 'em coming! 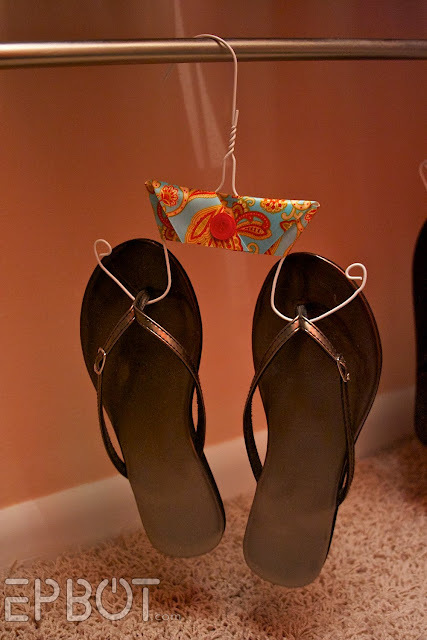 I have to say i've never ever thought of hanging up my slippers (that's what we call 'flops here in Hawaii), and I LOVE this idea! I have a basket full of slippers, and more than once have gone out wearing 1navy and 1black...this could solve that problem and look adorable to boot! Thanks for the inspiration! Very creative! I also have a few pairs of those shoes. Pink ruffle flats from Target? Do you remember when flip flops were called thongs? Like, back in the 80's when they only came in orange, green, or yellow? Heidi! Haha, my Mom refers to flip flops as "thongs" and it drives me crazy! In fact, my Mom and I just had this conversation a couple of weeks ago, too funny! Such a GREAT idea! Now I won't have a "mountain" of flip-flops. I LOVE flip flops!!! I have so many it's ridiculous. What a great idea for storing them. I live in Ontario, Canda but I wear them from March to November, and save the prettiest ones for the summer months. I even have a flip flop tattoo!! This is brilliant, not only because it's super space efficient, but also because it looks awesome. Too bad I don't have the hangers to do this or the option to attach a rod to the apartment wall without paying some ridiculous charge later. I've never really understood the desire to have many, many pairs of shoes, but that picture kind of makes me want to buy some. Now I want boots. Where did you get those magical yellow boots?! I LOVE them. Like your Converse(is that the right plural?, too. How timely! I'm getting ready to move and my new closet is going to be super tiny. I LOVE this idea!! So this has nothing to do with this post and you may already know about it but I found a cute shop on Etsy that has a bunch of steampunk-esq figures! Such a great solution! I'm not a shoe horse, but my daughter is. This is a fantastic way to keep things a little more organized. This grateful mama thanks you. Florida girl (that would be you)and Arizona girl (that would be me!) .... flip flops - must have - all colors ..... I hear ya sunshine sister! haha Great idea, thanks for sharing! I ownn those grey boots on the third shelf up also!! Unfortunately nothing would make my wardrobe neat and pretty, but if one day I get rich and have a gigantic walk-in wardrobe so everything fits - I'm soooo making them! It would also work for a scarf hanger too - you could put a scarf on each side. .. and if you had sturdier metal ones.. maybe even hang your handbags! Hi Obsi. A little off topic but storage related: A great way to store scarves is to hang a few shower curtain rings on a hanger. Loop your scarves through the curtain rings. Voila! I have a lot of flip-flops and sandals too. I'd live in them year round if Maryland weather would allow it (I did get to break mine out today though! It was 74!). For mine I have one of those fabric closet door shoe hangers. Two pairs of flip-flops usually fit in each pocket. It also holds my scarves and belts too. It works nicely since my apartment doesn't have walk-in closets. And I love that you just couldn't leave them plain. Oh gawd! I remember thongs! You should have seen my co-workers faces when I mentioned that my 86 year old mother used to wear thongs around the house all the time. It took me a long long time to get used to calling them flip flops. I don't have a clever closet system but I do have my spice cabinet alphabetized. I used the long narrow plastic drawer organizers (2 inches by 10 inches). Slide them in the kitchen cabinet so the narrow side end shows. Label each end with a letter. So my "A" organizer has Allspice and achiote. "C" has corriander, cumin, cinnamon, etc. I love that. If only I could make it work for other shoes. After reading this post, I feel as though my girl card should be removed. I have two pairs of boots (Army Issue Combat and Thinsulation style cold weather Sorels), one pair of rocker style sneaks and a pair of flats. That is it. My husband only adds about two more pair to the closet. Holy smokes you have a lot of shoes!!! Those hangers are sweet though. My storage involves throwing the "little boys sneaks" and flops under the bed and piling boots and heels in the corner of my closet. I also only have two pairs of flops and they only get worn in the house, I seriously can NOT walk in flops outside as it kills my feet and legs. Oh I love this idea. I have no idea how/where I'll implement it but I'm determined to. I'd like to think I don't have too many shoes but I've come to realize I've got about 30 pairs. That's not a lot is it? Brilliant. I like your shoe storage in general. i need to convince DH to give up some space-I need a shoe wall. Mine is the same basic concept as your shoes but I put it up higher and clipped on shower curtain rings. So you have a long bar with all these rings on it. Perfect for scarf collections. Fewer fold marks, less wrinkling and you can see all your beautiful options! I am mentally bowing to you right now. I'mma have to find me some wire hangers and another dowel rod for rack #3 of my closet. I love this idea! I don't wear flip flops but I do wear ballet flats, and my Chucks could go on these hangers too, providing the hanger is strong enough. Oh and by the way your closet is a a dream come true for me, if only every closet could be so clean. This is the most brilliant idea in the history of brilliance. Seriously, this is, like, the moon landing of shoe storage. I'm in awe. My solution is fewer shoes. I think I'm edging closer to a dozen pairs than a half-dozen, but some of those are at retirement age. I work in a shoe shop, and am worried about your boots on your shelves though...! they'll go all saggy round the ankles if you don't put stiffeners in them, so they stand up straight like your leg is in them all the time. I refuse to spend £15 on a tube of plastic and just rolled up thick cardboard to keep mine standing up. Hi Jen! I have to give you kudos! That is one well organized and enviable closet you got happening there. 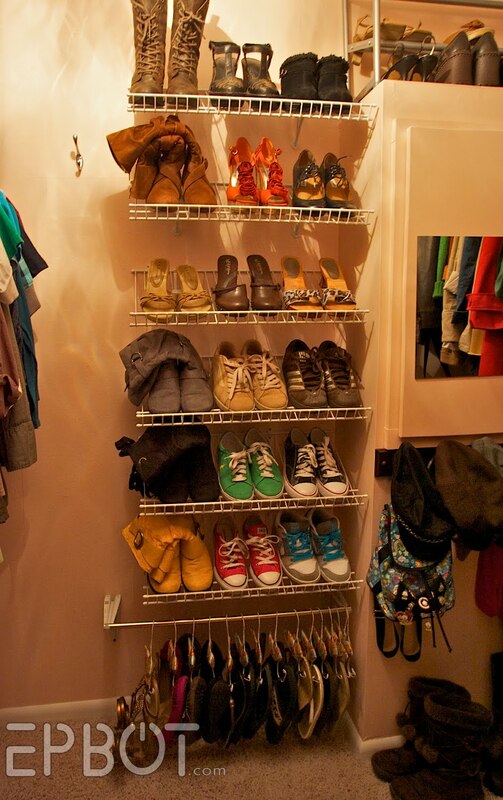 Love your shoe collection and your amazing creativity in solving your shoe storage dilema. You could also use scrap-booking cardstock with stamps and such to make the sleeves, but ribbon is a great idea since it is already pre-printed. I've been looking for some way to hang belts in my closet without just pounding large nails into my [apartment!] walls. This looks like it will do nicely for that as well as my flip-flop collection. Now I'm kind of glad my boyfriend didn't throw away his metal hangers when I told him to, so I can steal them for this! Mwahaha! :) Thanks, Jen! I live in Texas and we wear them ALL the time, too. My collection rivals yours and yes, I've been known to spend $30 for flip-flops. I love the little hangers so I'm going to give it a try. Thanks, Jen! I am soooo gona make one!! thanks for sharing your crafty awesomeness!! No tips here, but total shoe envy over your orange shoes! SOOO Cute! I just keep a nifty old metal storage tub/bucket near the door and I toss all my flip flops and the kids' crocs in there. In the winter, it holds slippers. Totally..... freakin'.... AWESOME!!! Wow! I just love your flip-flop hanger idea, Jen!! Heidi D - My mother STILL calls them thongs. llama,llama not yo mama - I was thinking the same thing re: hanging them from the wire rack. I have a set of tall, narrow wire shelves in my closet for holding shoes. I used ribbon and cardboard - copy paper box lids, actually - to create a hanging shelf below each "real" shelf, doubling my storage space! It's not pretty, but I used stuff I had lying around so it was free! Brilliant!!! Thanks for sharing the perfect way to store flip-flops! I LOVE this idea! I am making some today to hold my millions of flip-flops!! I love love this idea! I am so doing this! Your organizational skills are truly mind-boggling. Would you be interested in coming to Montreal to do a private consultation? I'll provide five-star futon lodging with all the tasty food you can eat, a local guide and metro pass, all the Xbox kinect you can shake a stick at, and any materials required for organization. You provide organization- and decor-minded brain. I can cook but MAN am I lacking in the keeping stuff neat and good-looking department. My 5 year old daughter just fell in love with your shoe collection. Then insisted she has more shoes. (She probably would give you a run for your money.) This will make it so much easier to find our flip flops! Time to start saving the cheapie hangers from the dry cleaner instead of returning them. Wicked! Now I finally have something to do with those old yucky wire hangers! Oh how I love shoes! I’ve got at least (ahem) fifty pairs, or something like that. ☺ As a California girl I, too have a great love for flip flops, but once my husband introduced me to Chacos I developed a definite preference. They’re not cheap, but they are super comfy (they actually have a good deal of support, which you might not like at first), and they last forever. Plus, since you’re pretty much guaranteed to love them and never want them to die, Chaco offers a full line of repairs, from new straps to new soles. Hmm…I’m feeling the urge to start searching for shoe sales online. Must resist!!! 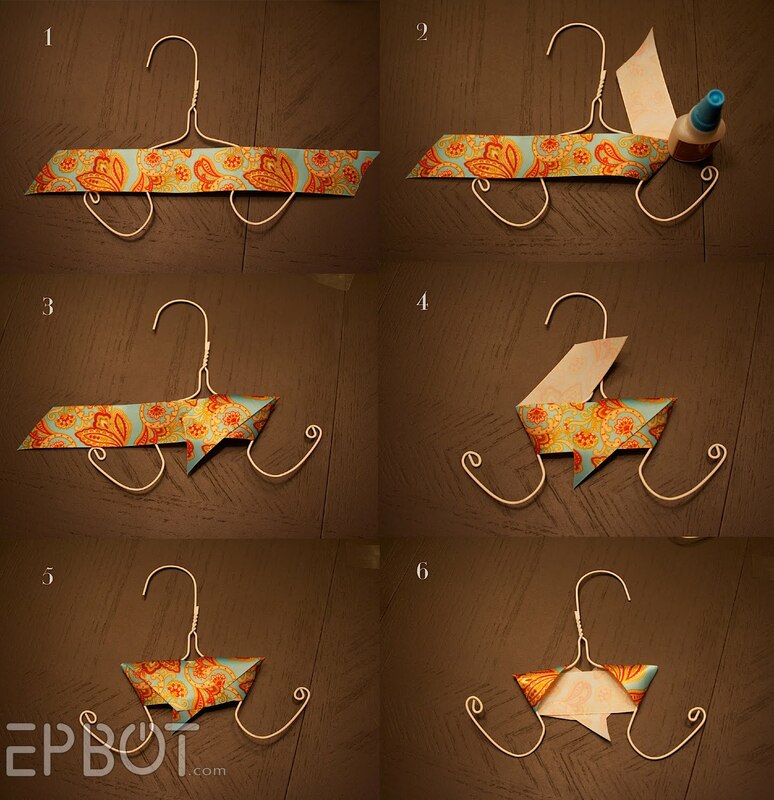 And yet another adorable, inspiring crafty idea from Epbot. Go Jen! thanks for sharing the flip flop organizer!! I at one point had 84 pairs of shoes but I pared down since then. (Although last year I became a VIP at both DSW and Zappos because I bought so much so maybe I'm back up there) I store my flip flops in a mesh pocket thingy that hangs on the back of my guest bedroom door. I also used old wine bottles for my boots to keep them from flopping over. How in the world do people do with one pair of each type of shoes? I put all of my flip flops in a bin with a lid. They get stored in the winter and in the summer the bin sits on my closet floor and I just toss them in there. It's not as pretty or fancy as your idea, but it works for me. Also, there is alot of un-used space behind doors. You can find over the door everything now-a-days including shoe racks, towel racks and even ironing boards! I go barefoot as soon as it's warm enough - so I don't own many shoes, but it looks incredibly pretty! Yet again Jen you never cease to amaze me with your crafty-ness!! I linked you in my Tumblr, I just had to share this idea with all my normal Floridian friends that own more than 2 pairs of Flip-Flops. I thank you & most of all, the hubs thanks you! I also am a native of the Sunshine State & thought flip flops & sandals was what everybody wore until I started kindergarten. I can know relieve hubby's anxiety over the FF Mountain that is in the corner of the bedroom! Keep coming with the great ideas!! This is brilliant! I hate my rubbermaid tote full of flip flops. What a great solution. Thanks for sharing! I don't have space in my coset, so I took out smallest bedroom and made it a closet too. This is the second house I have done this in. Of course there is a t.v. a treadmill and all package wrapping items in there as well...thats multitasking on a grand scale! I found this flip-flop picture and blog link through Pinterest.com and I have to say this is one of the most genius things I have seen. You could seriously patten and market these babies. Hanger companies would buy them up!!! Brilliant! We call them thongs here in Aussie and we live in them all summer long...thank you for a fantastic idea. This is awesome! I might make some of these for my bridesmaids' shoes, as well as my own! You are a genius, Jen! I saw this on Real Mom Kitchen's fab five. LOVE IT! I need to do this. Saw this on Real Mom's Kitchen and love the idea.. I've got the hangers out and the project will begin.. I have the pink Mossimo flats! these are amazing!!! I'm totally making some of these ASAP! Thanks for the tutorial! Jen, yet another creative project - you are so talented! 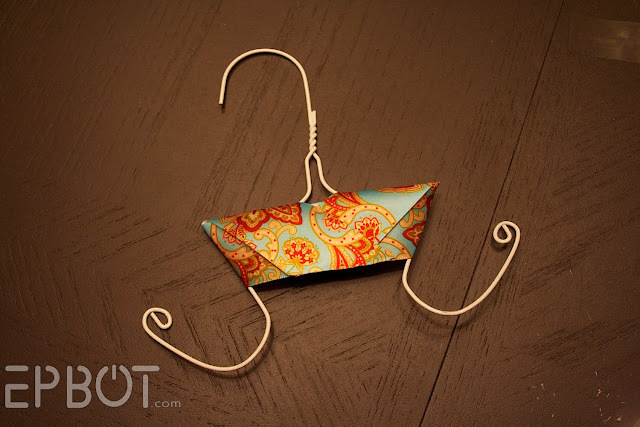 Even I could make these hangers, and I don't have a creative or artsy bone in my body. Please tell me the platform/wedge behemoths in the upper right corner of your closet photo are for a costume, because I can't imagine anyone wearing those (no offense intended, they're just really CHUNKY shoes). The orange pair is causing shoe envy in me, too. Keep up the great work here and over at Cake Wrecks - I'm a big fan! I had seen these flip flop hangers when I first got on pinterest and then I couldn't find them again. I wanted to know how they were made. 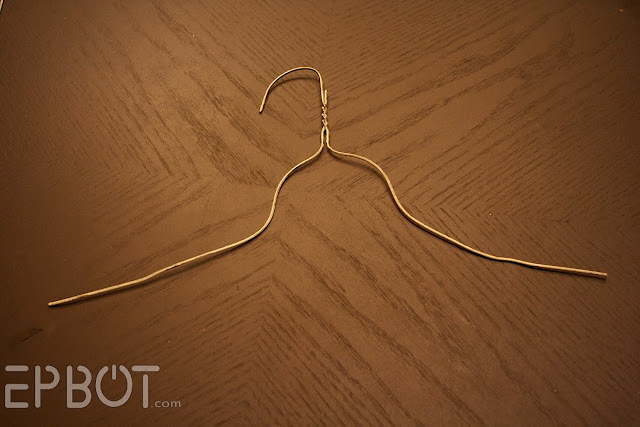 Anyway, I love the idea and I'll be saving wire hangers for a while. Thanks for the tutorial. if you like to keep your boots upright stuff an old magazine in them! to keep my boots standing tall I like recycling my water bottles by re-filling them with sand or even tap water. That way they are strong enough to give them the support they need without falling over !! These are just the cutest darn things I've seen. I am so doing this in our soon-to-be new home where we will finally have a walk-in closet! Thanks for being so creative. Thanks for the tutorial. I actually have this picture pinned on Pinterest. I was wondering how to do it! Brilliant, I so need these. Pool noodles work great to keep boots standing straight. I get 'em from the dollar store and cut to fit different height boots. Genius! I am soo making these! G-R-E-A-T I-D-E-A!!!!! I need to have you at my house and fix my closet. 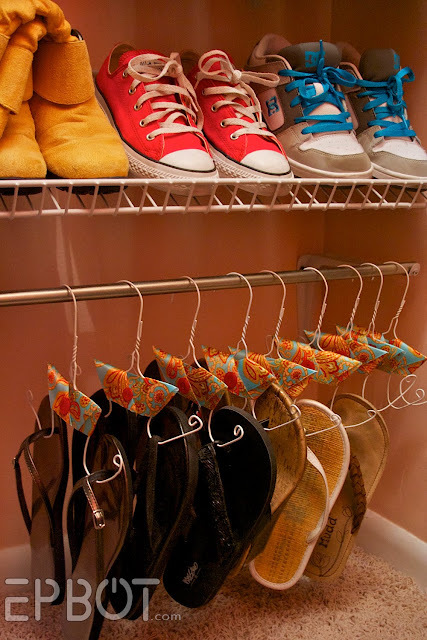 This flip flop hanger is an awesome idea. Pinning it! Love this! Where did you get the racks/shelves for the shoes in the last picture? The shelves are plain ol' white wire shelving just hung at an angle, Jackie, so you can find it at any hardware store. I found this on pinterest and this is the cutest thing EVER!!!! I don't have flip flops, but saw this on pint rest and I am so doing this for my hubby's hats. Thanks for the great idea! cute, budget friendly & functional...what more could you want? Great idea! btw: I have the same pair of Steve Madden shoes you have second row from the top- middle pair. Tangerine wedges with flowers--yep I have them in yellow and they are my favorite! get compliments every time I wear them. I have a question .. what thickness was your ribbon? It looks like 1 or 1 1/2" .. but I just wanted to be sure so I didn't get it too thick or too thin. I've just post it in Portuguese on my website, gave u all the credit! Feel free to visit. Just click translate this page to see in English! Thanks this idea is awesome! Love this!!! 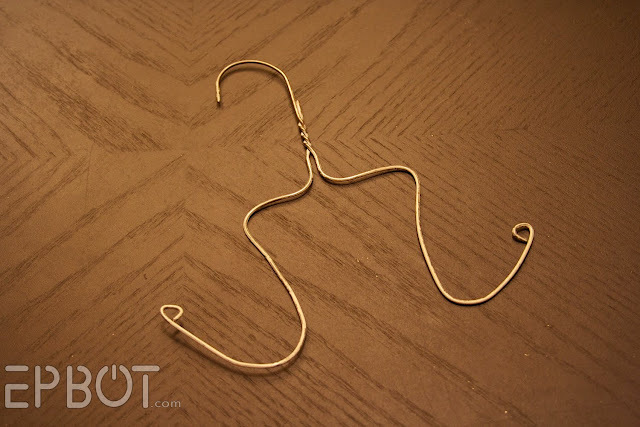 I just took one of my daughters coated wire hangers, didnt cut at all, and bent the ends up (kinda like a smile), spent a few miutes fiddling with it and opening up the loops a bit a little more rounded to fit better in the shoes, and then folded the bent up ends in to the center, like bookends. It looks like it is going to work great for hanging all my little ones shoes from tennis shoes to flats and i can still hang flip flops on it. With an adult size hanger I can hang bigger and heavier shoes on it. Thanks for such a wonderful idea. I loved this idea.. thanks for sharing :):).. I blogged about it here..http://nicksnacksbyme.blogspot.com/2012/01/from-trash-to-wow-ii.html. WOW! I am a young mommy (23) and I wore flippers (flip flops) all last winter because I was sooo overheated the whole time! Finally the "mountain method" shall disappear :-) This is the BEST idea! Oh my gosh!!! Those are the greatest things ever!! I live in Minnesota and have a flip flop fetish (weird, I know!) so this is a great thing for my closet! Yay!! I made a whole bunch of these for Christmas presents (15 sets of 10 to be exact lol) .. and I will say this .. don't use glue dots because I found that after about a week they eventually turn loose (good thing I got started early lol).. a small drop of hot glue in place of the glue dots worked sooo much better. 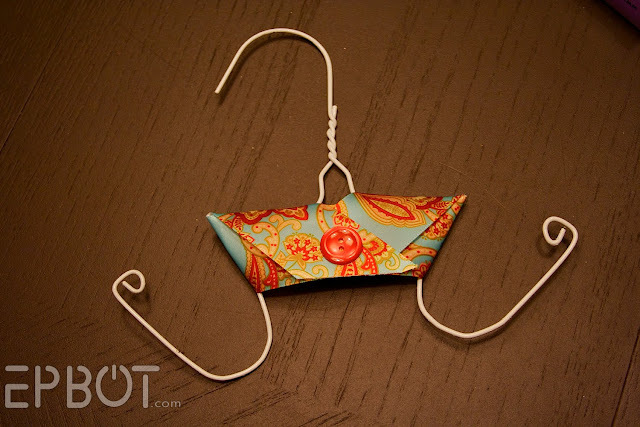 A short cut to make the hanger would be to use a pants hanger, just remove the card board roll and turn up the edge! These are really cute. Who says no more wire hangers! This is a great idea! This is a GENIUS idea! I have ton's of flip flops-as you said we in the southern states where variations year round. This solves a problem I had this a.m. "finding" a match to pair I had to wear in the sandal pile. Love this! You can place a rolled up file folder inside of your boots that have "floppy" tops and place the tall (newly straightened) boots on your TOP SHELF. THANKS for the post! Had to share this on my fanpage - To Be Me Jewelry. I'm such a flip-flop lover! Looooove this idea! I have sooo many flip flops I always have to dig around in my pile. I actually worked on this the other day and my closet looks so much more organized. Now I can actually find my flip flops especially when Im on the go! ;) Thanks for such a great idea!! I love this idea!!! I have been trying to figure out what to do with my sandals, and this is the answer! I hate those wire hangers and refuse to use them, BUT, now I have a great use for them. Thanks for the tutorial! 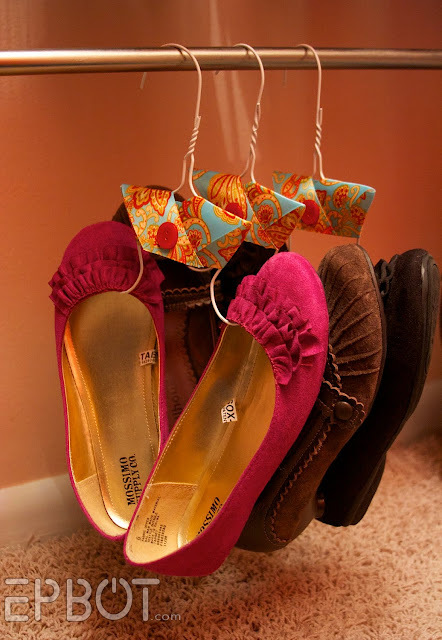 Oh my, I do love this idea for a shoes lover with so little space to store them ;D WIll do thanks for sharing. This is one of the BEST diy ideas I have seen in a long time! LOVE IT!!!!! I am going to dip the hangers in that rubberized paint for tools and add a can pop top to each one to hang them vertically. More useage and less space. 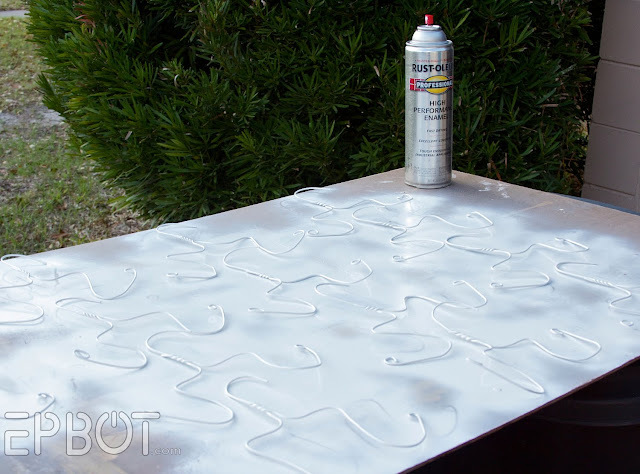 The plasti dip now comes in a spray. No need to dip anymore! With flip flops being my footwear of choice....love this idea! this is my version. tanks for the idea. Absolutely LOVE it!!! My flip flops are all where I can find them :) THANK YOU!! a very clever storage solution...and really pretty. Would you have a tutorial on making an "extender" that would allow one to hang these hangers from one another w/o dirtying the contents by rubbing the soles of one on the tops of the others. This would allow those of us that are more "closet-starved" to hang a column of your wonderful flip-flop/flats hangers from a higher rod or a hook on the wall or back of the door. The page: When the Dinner Bell Rings reposted the pics (I added your link for proper accreditation). I used plastic coated wire hangers instead of spray painting to save time. Thanks for your great idea! I gave the link to this page in the comments and asked for credit on your behalf, I'll keep an eye open, they might repost more of your ideas. Omg. I love this idea. I've always hated wire coat hangers. Not anymore. So cute! Wow what a great idea! Easy to make and great for closet organization. I'm gonna use this in my nieces closet..........but for her I think a good shower tension rod going across the back part of her closet behind her clothes is gonna work great and save her tons of space! Thanks for the idea! I SET MYSELF UP TO SEE SOMETHING RIDICULOUS-BUT I WAS CLEARLY WRONG! THIS IS A PRETTY BRILLIANT IDEA AND I HATE MY SHOES BEING STACKED ON EACH OTHER ETC!! TY FOR SHARING!! Yes indeed as noted "genius". Look forward to making these! I have a tip to free up a little space in your closet. You'll also need wire hangers the plastic hangers hanging part is to large to fit through the tab opening. I use pop can tabs bend off if there's a sharp area hang pop tab on the neck area of the hanger put it over the hanging part and then you can hang another hanger in the pop tab so you have two hangers in the space of one. If this doesn't make sense comment I'll check them and answer your questions.